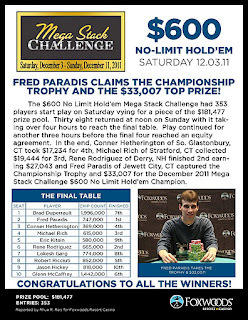 Fred Paradis Wins the $600 Mega Stack Event! The final four players in the $600 Mega Stack Challenge event have come to an agreement on an equity chop. Fred Paradis is officially the champion of the event, taking home $33,007 and the Mega Stack Trophy! The board runs out [Jd][Th][9s][7d][Jc] and Paradis makes quads to win the pot and eliminate Ricciuti in 5th place for $9,890. A short stacked Glenn McCaffrey gets all-in before the flop with [Kh][Th] against the [5d][5s] of Rene Rodriguez. The board runs out [6d][5h][2c][4d][Kc] and Rodriquez improves to a set. McCaffrey is eliminated in 6th place and takes home $7,985. Brad Duperrault gets all-in before the flop with [Td][Ts] against the [Ad][Kc] of Michael Rich. The board comes [As][Qs][4h][7h][Kh] and Rich wins the pot with two pair. Duperrault is eliminated from the $600 Mega Stack event in 7th place for $6,624. The board runs out [Ad][Js][9s][3c][9c] and Durerrault wins the pot, eliminating Garg in 8th place for $5,354. The board runs out [Kd][Kh][3s][Qd][7c] and Rich's pocket aces hold up to win the pot and eliminate Kitain in 9th place for $4,360. On a board of [Jh][8s][5d], Rene Rodriquez moves all-in and is called by Jason Hickey. Rodriquez turns up [Ac][Ks] for ace high but Hickey shows [Kd][Jd] for a pair of jacks. The turn is the [5s] but the river comes the [Ad], giving Rodriquez a pair of aces and the double up. Hickey was left with just a few chips and was eliminated from the $600 Mega Stack on the next hand in 10th place for $2,994. We have reached the final table of the $600 Mega Stack Challenge. The blinds are currently 12,000-24,000 with a 4,000 ante. We are now down to the final two tables in the $600 Mega Stack Challenge event. The blinds are currently 8,000-16,000 with a 2,000 ante and the average chip stack is 464,000 with 19 players remaining. 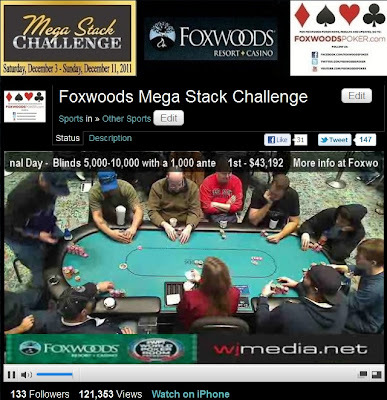 You can watch the live feed by clicking "Watch LIVE Feature Table" at the top of the page. We had a total of 238 players in the $230 NLHE Deep Stack event at the December Mega Stack Challenge. $600 Mega Stack Final Day Now Streaming Live! The final day of the $600 Mega Stack Challenge event is now underway. There were 38 players returning for Day 2 action and we are now down to the final three tables. The blinds are currently 5,000-10,000 with a 1,000 ante and the average chip stack is now 294,000 with 30 players remaining. You can watch the live stream of all of today's action by clicking "Watch LIVE Feature Table" at the top of the page or by clicking HERE. Play has come to an end on Day 1 of the $600 No-Limit Hold 'em Mega Stack Challenge Event. End of Day 1 chip counts and Day 2 seat assignments will be posted here on FoxwoodsPoker.com as soon as they are made available. $600 Mega Stack Challenge Event in the Money! We are down to the final 40 players in the $600 Mega Stack Challenge event. All players are now in the money and guaranteed at least $1,234.